The Fraternal Order of Police (F.O.P.) Lodge 10 is hosting the Annual Officer Jason “Woody” Faulkner Memorial Golf Outing on Friday, June 24th, 2016 at A.J. Jolly Golf Course. 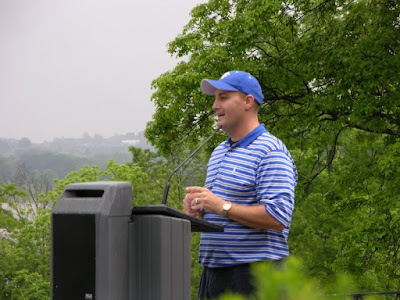 The golf outing directly supports local charitable events throughout the year. Fort Thomas Police Officer Sean Donelan has been helping organize the golf outing for approximately ten years. For Donelan, the event allows him to enjoy a day of golfing with friends while also helping serve the community. “Of course the event is fun, and the camaraderie of getting together with police officers from the different departments, judges, lawyers, business owners, and all the supporters of F.O.P. is great, but all the effort, all the work, all the time that we take to do the outing is manifest in the second weekend in December when we get to take a bunch of kids Christmas shopping, who otherwise wouldn't have Christmas," said Donelan. Officer Donelan isn't the only member of the FTPD working to make this year's golf outing the best to date. Lieutenant Casey Kilgore and Officer Will Hunt are also helping to organize the event. They have all experienced first-hand how this golf outing is able to help support the community. In 2015, 37 Northern Kentucky police officers helped 40 children with their Christmas shopping at Cops and Kids (formerly known as Shop with a Cop). In addition to Cops and Kids, the funds raised from the outing are used to support local athletes participating in the Special Olympics. Officers also look forward to attending the Special Olympics each summer. “We have the honor of putting medals on athletes after finishing their events,” said Donelan. Fort Thomas Police Officer, Sean Donelan. Each year, Donelan is humbled by the amount of people taking time out of their lives to attend the golf outing and help support the community. “I think my favorite part of the day is about halfway through registration when I realize all these people, who have taken time on a Friday to come out, and take a day off or leave work early to come out and support us. I think the motivation, the excitement, the enjoyment comes from knowing what the fruits of our labor are, and that's supporting Cops and Kids and Special Olympics and other charities throughout the year," said Donelan. The golf outing is open to golfers of any age and skill level, and is set up in a four-person scramble format. The entrance fee for each team of four is $300 ($75/person) if paid by Friday, June 10, 2016, or $340 ($85/person) after June 10, 2016 until the event date. The participation cost includes lunch before the golfing begins, dinner, drinks throughout the event, raffles, and prizes. Registration and lunch will begin on Friday, June 24, 2016 at 11:00 a.m. and last until 12:30 p.m. in order for participants to be ready for the shotgun start at 1:00 p.m. The event is only open to 32 teams, so teams interested in participating are encouraged to sign up as soon as possible. This event is also a great opportunity for local businesses to also help the community by stepping up sponsoring the golf outing. There are four ways to sponsor the event: Hole Sponsors, “19th Hole” Sponsors, Corporate Sponsors, and Major Raffle Sponsors. For $100, Hole Sponsors are provided with a 2' x 2' sign on one of the tee boxes at a hole throughout the course. “19th Hole” Sponsorships will run donors $135, and feature a 2' x 2' sign that will be placed at one of the course's beverage locations. The Corporate Sponsor slots are up for grabs for $250, which includes a 32” x 52” banner placed in a highly visible area on the course. Corporate Sponsors will also have their names posted on a large sponsor board at the dinner location, and they will also be recognized during registration and dinner. Lastly, Major Raffle Sponsors may donate items of cash to be used as raffle items during the event. Items must have a retail value of $100 or more, or cash donations will be accepted and used to purchase raffle items. Major Raffle Sponsors will also be recognized during both registration and dinner. For more information about participating in the Annual Officer Jason “Woody” Faulkner Memorial Golf Outing or becoming a sponsor, you can contact Officer Sean Donelan at 859-757-8778.